The Ti–6.5Al–2Sn–4Zr–1Mo–3Nb–0.5W–0.2Si (1M3N0.5W) alloy is a novel two-phase high-temperature alloy for short-term use up to 700 °C. The effects of different heat treatment regimes on the microstructure and mechanical properties were investigated through optical microscopy (OM), scanning electron microscopy (SEM), and tensile tests at the temperatures up to 700 °C. The results show that 1M3N0.5W alloy treated after single-stage annealing can get bimodal structure, which consists of equiaxed primary α (αp) phase and lamellar transformed β (βt) structure. The ultimate tensile strength (UTS) and 0.2% yield strength (YS) of the alloy at 700 °C are 473 and 310 MPa, respectively. The 1M3N0.5W alloy treated after solution and aging treatment can get Widmanstatten structure, which consists of coarse primary β-grain and secondary α-phase precipitated on the β-grain. 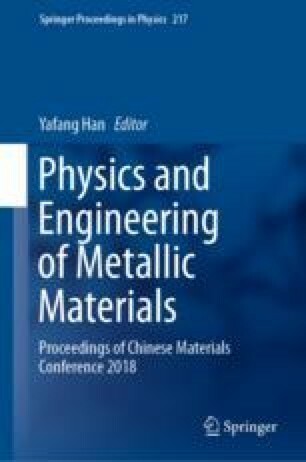 Compared with single-stage annealed alloy, the UTS and YS of the solution and aging treated alloy are significantly improved at 700 °C, while the room-temperature plasticity is dramatically reduced.